【下】为什么发明火药的中国人在公元1500年之前没有发明突击步枪（连发速射步枪） [美国媒体] Why didn't the Chinese, who invented gunpowder, have assault rifles by about 1500 AD? heavily armored knights and man at arms that cold weapon projectiles weren’t very effective against. But for China, these aren’t the problems they faced, and thus it wasn’t the solution they approach towards. We can equate this to the situation of say… WW2 to Cold war era military tech vs today, we can reasonably argue that the developments in the last 2 decade or so is nowhere close to the advances from the 30s to 80s in a relative sense, while drones are cool and the new infantry gears are useful in what they want to do, ultimately these things aren’t quite as much of a difference maker if the US were to engage in full out conventional warfare against a relatively comparable foe. Well of course the problem is there is no comparable foe to fight conventional warfare with. and that’s sort of the equivalent of the Chinese military technology development. It made things that are interesting in it’s own ways but doesn’t really push the boundary of technology all that much and isn’t very practical in large scale long term conventional warfare. In Europe innovation of gunpowder weaponry occurred chiefly on the production side. It is not usually soldiers who come up with a better firearm or more potent gunpowder. Later on during the 17th and 18th century we see more guided designs and developments being contracted out. Standing armies became a thing and there was a need for standardized guns. Governments set up boards or separate branches of government to deal with acquiring guns. These boards then came up with a standard model such as the 1770 Charleville Musket (Charleville musket - Wikipedia) and then found private contractors to built them according to the specifications of the model. But as you can see on the wikipedia page these models were revised every few years as experience or innovation changed the desired guns. The musket mentioned above was of french design but the manufacture of them also happened in England where British contractors took on the job of making them. During the American revolution the French shipped quite a few of these model 1770’s to the colonies where they were used to shoot British troops. In many ways supplying armies with equipment happened then just as it does now. A small branch of government dictates what is needed and then finds private defense contractors to actually deliver it. In China during the same period the production side innovated a lot less. The European Matchlock was introduced by the Mughals around the year 1510 and by the second Opium War the rank and file soldier was still walking around with those. I am not sure why but it seems like the market was a lot less flexible in China, designs were kept until a top down order came to replace or renew them. This might be because the Chinese government was the only customer of the Chinese arms industry. China used to have guns and cannons. One of the three major forces, called Shen-ji Camp, was equipped with guns and cannons. This army was professional in firearms and missioned to protect the capital as well as cooperating with the cold-weapon army. 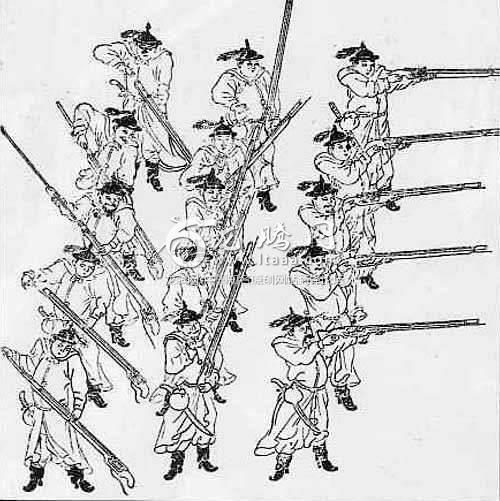 Above： Shen-ji soldiers pictured in “Huo Long Jing”, a book written in 1403. However, as the governors decided to build the Great Wall, Shen-ji Camp was disbanded for the reason of being untraditional. Some say the governors were scared by the power of firearms, while others argue that the primitive firearms used by Shen-ji were not capable to dominate the battle. A more widely accepted explanation is the disbanding was due to the closed-door policy of Dynasty Ming. At that time, Dynasty Ming blocked nomads like Mongolian riders outside the wall and completely shut down the sea by forbidding people for long distance voyage. They not only banned long voyage into the sea but also mandatorily changed all the boat into a design incapable of voyaging on the ocean. At the same time, the Great Wall required a huge amount of resources to maintain. Such cost drained the country’s tax income. And the country has to spread all the soldiers along the Great Wall for patrol. The Dynasty Ming then in no way can attack the nomads, but keep investing more resources on defending the wall. The Shen-ji Camp, as an untraditional army, cost far more resources than regulars and shows no benefits as the country does not attack at all. Unsurprisingly, it is disbanded. And development in firearms, together with all kinds of other technologies, were stopped. Communication with Europe was also blocked. 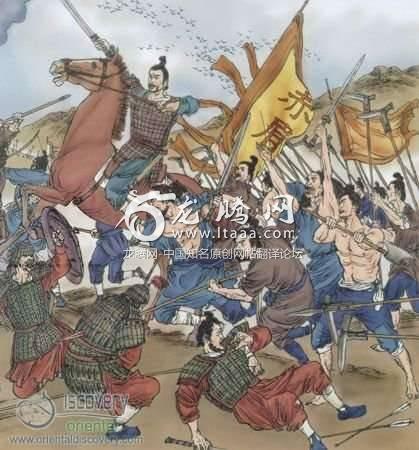 At that time there was no Xiongnu threat or another… Then why they built it if not to prevent villagers to escape? Allen Jones, Working in the industry in gun and ammunition mfg. Originally Answered: Why didn't the Chinese invent better guns? About 140 years later gets the minor improvement of percussion caps along with adoption of preassembled cartridges of linen or paper wrapped bullet and gunpowder. Enclosing the entire cartridge including the percussion cap/primer into a single, relatively waterproof, standardized in dimensions as well as contents, and mass produced by the millions, which took 40+ years to work out from Hunt’s hollowed out bullets to the Berdan primered centerfire cartridges of the 1870’s, was the biggest advance after the flintlock in the late 1600’s. The snaphaunce, wheel-lock, flintlock, and percussion cap are all European inventions. Rimfire and centerfire cartridges are American inventions. Lever action rifles are mostly American and bolt action rifles are mostly European inventions and innovations even though they came when China was industrializing as well in the last half of the 19th Century. It may well be something as subtle as how inventors were treated and funded, how readily inventions could be commercialized on a mass scale in each country then. Well to cut very long answer short, assault rifles do not use gunpowder. Propellant used in assault rifle cartridges is not kind of gunpowder invented by Chinese, it is smokeless powder and that is very very different kind of stuff. Also stuff inside primers has nothing in common with gunpowder. And Chinese did not have kind of chemistry knowledge and basic theories needed to invent those things. Now also Chinese did not have kind of knowledge you need about metallurgy, precision manufacture, machining metals and so on and on. Assault rifles and their cartridges are products of modern industrial societies. Basically you are asking why Chinese did not have scientific revolution in 1200’s, industrial one in 1300’s, steam power in wide use at 1400’s and those assault rifles at 1500’s. Timetable I used is somewhat similar as West in real history had. Scientific revolution started roughly 1600’s, industrial at 1700’s, build up of industrial society at 1800’s, and those assault rifles and myriads of other stuff at 1900’s. This question was sort of asked in Guns, Germs, and Steel bt Jared Diamond. It’s a wonderful book, if you have the time. On the other hand, Europe, due to social, climate, and geological reasons, was a cauldron of war for centuries. Ever few years Europeans came up with new and better ways to kill each other. When the gun entered Europe, it went into this crucible of war, and developed very quickly by necessity. This is pretty much the answer to all of those “Why did Europe…” questions. Too many people, not quite enough land or resources for everyone, but just enough for everyone to have some, the resultant social pressures. Of course Europe developed quickly and exploded out into the world. why didn’t the Chinese have assault rifles early on is a good question. given the constant threat from the steppe barbarians in the north its surprising the Ming dynasty didn’t ramp up it’s military R&D. actually the employment of razor wire and anti-personnel mines like Claymores or Bouncing Bettys deployed in depth would have made a hash of Mongol hordes. China, like most pre-industrial civilisations, had a sharp separation between brain-work and handycraft. So though there was a lot of invention, it mostly did not try rethinking things from first principles.